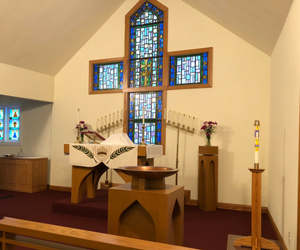 Pastor Tom’s Mission and Ministry Report The grace of our Lord Jesus Christ, the love of God, and the communion of the Holy Spirit be with all the people of Williams Bay Lutheran Church. (Here is my annual report to the congregation. God has truly blessed our congregation in 2018.) This past year was filled with both challenges and joys. Overall, I am grateful for the many ways that we came together as a faith community in order to move our congregation forward in mission. Thank you to all the people of Williams Bay Lutheran Church! I am especially thankful to God for three surprises that happened this past year. working ecumenically with UCC and Chapel on the Hill for more ecumenical worship services. During the five Wednesday Lent services Pastor Tom will be inviting people to share their faith stories during Lent worship. Have you ever given your faith testimony to others? Would you like to? Sharing our faith is an important way to spread the Gospel. If you are interested, please let Pastor Tom know and he will assign you to a Wednesday service. He can also offer you some coaching and guidance in writing your faith story. Pastor Tom has invited the Voice of Praise Chorus to join us on Sunday, March 17th for the 9:30 am worship service. The Voice of Praise is a local religious chorus. Their mission statement is to Sing God’s Praise, to Tell God’s Story, and to Sing God’s Praise. We will have a unity service on that day. There will be no 8 am worship. Come and hear this talented choir as we listen to and join in on singing God’s praises! Morning Class. We meet at 11 am in the Hearth Room on Sunday mornings. Come with you questions and grow in your faith. Pastor Tom would love to have you join the group! All are welcome to join in on this new topic. Come and join Pastor Tom for lunch and a Bible study. We will meet for four weeks to study the Psalms. We will begin our first study on February 14th , Valentine’s Day, at 12:30 pm. We will use the study guide: Psalms, Prayers of the Heart by Eugene Peterson as a guide for our conversation. We will meet in the Hearth Room. Bring your lunch and your Bible. All are welcome! Please join Pastor Tom for conversation on becoming more passionate in our faith lives. How do we live with passion for our Lord? How do we make sense out of our beliefs? How are we to live out our faith in our day-to-day lives? Come and join in on the discussion! We meet on Sunday mornings at 11 am. All are welcome! level of the church. If you have any questions about where to get the book, please see Mary Mock or Cheral Sadler. Every year during Lent we have the opportunity to renew our relationship with God and with the people in our congregation. During Lent we prepare for the celebration of our risen Lord, Jesus the Christ. Lent can be a very meaningful time for us within the church year. Lent begins on Ash Wednesday, March 6th. On that day we will worship at 7 pm with our special Ash Wednesday service. During the next five Wednesdays of Lent you will hear faith testimonies from people in our congregation. Pastor Tom will also offer a short message. His topic this Lent will be: “Understanding the Bible.” Our worship services will be the beautiful Holden Evening Prayer Service. All services will begin at 7 pm. A delicious soup dinner will be served before worship. Come to the Lent services and find renewal for your faith journey. LENTEN SOUP SUPPER Lenten Soup Suppers will resume on March 13th. Come and break bread with your church family before our midweek Lenten services. Two to three types of soups, bread and a sweet desert are served up from 5:30 pm to 6:30 pm. Recently, I picked up a book off the shelf in my office that I first read back in seminary. The book is called the: The Lost Art of Listening by Michael Nichols. As I am reading through the book once again I am reminded of the importance of listening. In the book Nichols makes the point that listening is so basic that we often take it for granted. For example, just the other night my daughter was speaking to me about an exciting thing that happened during her school day. While she was speaking my mind was elsewhere thinking about my own day. My wife, Kalen could tell that I was not listening. “Tom,” Kalen said, “Are you listening to what Evie is telling you?” I was caught! Quickly my mind came back to the moment. “Sorry, Evie,” I replied. It was true. I was not listening and I was missing an important moment with my daughter. In the church it is also very important that we listen to each other. Often misunderstandings can occur simply because we are not listening. As Nichols points out, the reality is, that most of us think that we are far better listeners than what we really are. That includes me! May God bless as we work to listen to each other with love. May God guide us to truly listen to each other. May the Holy Spirit speak to us in such a way that we can listen and hear what God is saying to us even now. On December 2nd we will begin the new season of Advent. During Advent we await and anticipate with glad hearts the coming of Jesus. On that Sunday we will also be welcoming a large group of new members at both services. The church council will be serving coffee and desert refreshments on that day. Please come and welcome our new members! This year our traditional Christmas Eve worship times will be at 5 pm and 10 pm on Monday, December 24th. Come and worship the birth of our Lord and Savior Jesus Christ. There will be a unity service on Sunday, December 9th at 9:30 am for the Christmas Cantata worship service. There will be no 8 am worship on that Sunday. Order your Christmas Poinsettia plant to help decorate the church on Christmas Eve Day, and your home afterwards. We will be ordering the plants from Pesche’s Greenhouse again. Order sheets can be found in the bulletin or on the narthex table. We joined with United Church of Christ and Chapel on the Hill for a community Thanksgiving service. An offering of $602.50 was taken for Agape House. A large ecumenical choir sang for the service and Rev. Sean Walker gave the message. It was a very meaningful worship service as we all gave thanks to God for God’s many blessings. All WBLC women are welcome to join our Sally’s Circle meetings. Some of the participants knit or crochet prayer shawls or do other hand work while we talk. Our meetings are very informal and are a great way to get to know each other. We meet in the Hearth room in the lower level of the church. If you have any questions about where to get the book, please see Mary Mock or Cheral Sadler. Thank offering boxes can be turned in and placed in the large basket located in the narthex. Money will be sent to Synod WELCA. Collection will continue through December 9, 2018. Mitten Tree will be up December 2nd. Branches will be reaching out for your donations of NEW or slightly used mittens, gloves, hats and scarves. Periodically items will be given to our local schools and homeless shelter. Donations will be taken through January 20, 2019. The Williams Bay Lutheran Handbell Choir was warmly welcomed by Christ Lutheran Church of Sharon on Sunday, October 21st where they performed 10 songs with narration assistance by Kyle Marshall, for their first official Handbell Concert. A time of fellowship followed the concert, which allowed us to get meet some of their parishioners. A free will offering was taken at the concert & we are happy to say that we received over $250.00 in donations. We chose the Agape House in Walworth to be the recipient of this generous free will offering. On Tuesday evening, November 13th, our Handbell Choir was invited to play for the Norsemen of the Lakes Memorial Service held at WBLC & led by Pastor Tom. 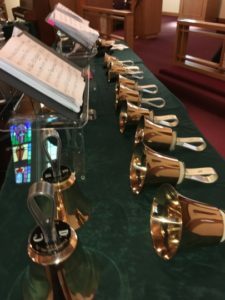 The Handbell Choir performed 3 songs for the service and there was the tolling of a bell for each member that had passed away from their Sons of Norway Lodge in the past 20 years. It was an honor to be asked to be a part of this service and appreciate their hospitality & fellowship following the service. On Sunday, December 9th during our 9:30 AM Unity Worship service (no 8:00 AM service on that morning) our Christmas Choir, Handbell Choir, Sunday School children & Confirmation students will present “Emmanuel—God With Us!” by Lloyd Larson, featuring songs such as Michael W. Smith’s “Christmastime”, Amy Grant’s “Breath of Heaven” , the popular song “Mary, Did You Know” & finishing with a traditional Christmas Carol medley. Come and enjoy this intergenerational experience. Williams Bay’s Atrium, Walworth’s Golden Years, Elkhorn’s Lakeland, & Lake Geneva’s Arbor Village Care facilities. Thank you to the Handbell choir for gracing us here at Christ Lutheran with a beautiful concert. The music was wonderful, and it was meaningful to be together. Thank you also for providing refreshments. What a treat! Many people have shared how much they enjoyed the afternoon. May God bless your ministry of music as you continue to share your gift with others. Lenten Soup Suppers will resume on March 13th. Come and break bread with your church family before our midweek Lenten services. Two to three types of soups, bread and a sweet desert are served up from 5:30 pm to 6:30 pm. Sign-up will begin after January 1st. WELCA Outing is being planned for March 3 (3:00 pm) at UW Whitewater Young Auditorium. Young Auditorium will present Church Basement Ladies – Rise Up O Men. Last time our group went we had loads of fun and rolled with laughter. Please consider joining us and bring your spouse with you! This edition of SBL is about the men in the church. The musical looks through the eyes of the church men as they take part in the town’s Centennial Celebration. If you are interested, please sign up on the sheet in the narthex before December 25th. WBLC had 10 walkers participate in the year’s CROPWALK, raising $405. An anonymous donor matched these donations for a WBLC total of $810. In all, over $10,000 was raised. A final total will be coming soon. Sunday, November 5th was our annual children’s sermon focusing on the work of Heifer International. Our Sunday School and VBS offerings are donated to Heifer International for their use in ending world hunger and teaching sustainable farming. For about the 10th year running, we had a visit from our own Heifer to help with the children’s sermon. Their children chose the following animals to donate: 2 pigs, 1 set of honeybees, 1 flock of ducks, 3 flocks of chicks, 1 goat, 1 llama, 1 sheep, and a share of a heifer. To donate or learn more about the program, visit www.heifer.org. The annual meeting will be on January 27th after the 9:30 a.m. service. The annual committee reports must be turned in to the church secretary by January 10th. Following the meeting join us for the potluck. The month of August will mark two years that we have been together in our ministry with and for Jesus. I had a seminary professor who once said that the first two years of a new pastorate in a church can be challenging as both the pastor and the congregation figure out how to do ministry together. We made it through the first two years! I am thankful for your grace, love, and patience as we figured out how to do ministry in our new life together. You may have noticed that the name of this newsletter has changed to: Life Together. I felt that this was a good, new name for our newsletter. In our life together in Christ we work and share life together in order to make Christ known here in this place and in this community. Thank you for sharing your life with me these past two years! Let us now look to the future and to the ways in which God will bless the ministry that we do together in Christ’s name. I am looking forward in seeing how the Holy Spirit will move in year three of our life together. Come and see! Get prepared for some new worship music & worship experiences coming this upcoming church music season. We have already begun adding some more contemporary songs to our services as well as adding some visual experiences to our worship services as well. Our Chancel Choir will be returning to add their special messages generally on the first two Sundays of the month. We welcome “older” youth thru adult to come & join us. Our first rehearsal will be on Wednesday, Sept. 5th at 7:00 PM in the sanctuary. Our Handbell Choir will be sharing their instrumental music generally on the 3rd Sunday of the month. We still have openings for 3-4 more ringers. (You do not need to know how to read music, just know your left from your right hand & be able to count to about 4. The music is color-coded for you.) Our first rehearsal will be on Wednesday, Sept. 12 at 7:00 PM in the sanctuary. We hope to reschedule the postponed concerts from late spring to the end of October or beginning of November. Please watch for further details regarding the specifics in our next newsletter or on our website. We will be presenting the Christmas Cantata, “Emmanuel, God with Us”, which will feature our Sunday School Children, Handbell Choir, & special Christmas Choir. The tentative date for that presentation will be at 9:30 AM during our worship service on Sunday, December 9, 2018. With the introduction of “newer” songs to our worship services, we are looking for those interested in reading song introductions, persons who would like to play an instrument to accompany the new songs, such as guitar, bass, drums, flute or something else that would enhance the songs as well as those who might wish to assist as vocal song leaders. If you have any questions, please contact Carol Berndt, Music Director choirdirector@wblc.org. GOD’S WORK. OUR HANDS SUNDAY. On Sunday, September 9, our church will be participating again in a meal packing event at Lutherdale Bible Camp. This project benefits our local food pantry along with area food pantries. Please let Pastor Tom or Jim Pfeil know if you are interested. We will meet at Lutherdale from 1:00 to 4:00 pm. All are welcome to join in on this mission work! Sunday School begins on September 9 during the worship service. All children ages 4 through 6th grade are welcome. If you are interested in teaching Sunday School or have any questions, please contact Kari Pfeil at 262-607-6166. A huge thanks to all who helped to make this year’s Vacation Bible School a success! Thirty-five kids attended VBS this past week! The week of VBS ended up being a wonderful outreach ministry to the children in our community. Praise God! On Sunday, September 9th Pastor Tom will offer a special blessing and prayer for all of our Sunday school children as they begin a new year of school. He will also have a special gift for each child. Children, please bring your school back-packs on that day. This fall there will be a class on discipleship. We will read the book: Real Faith for Real Life: Living the Six Marks of Discipleship by Michael Foss. During the class we will talk about what it means to live as disciples of Christ. We will meet on Sunday mornings from 11:00 – 11:45 beginning September 16th. All are welcome to join in on the discipleship conversation. Pastor Tom is considering teaching a “Lunch Bible Study” this fall on Thursdays from 12:00 – 1:00. We will meet at church with a sack lunch or maybe even, from time to time, a nearby restaurant. If you are interested please let him know. All are invited to attend the bishop installation service of Viviane Thomas-Breitfeld at First Lutheran Church (612 North Randall Ave.) in Janesville on Saturday, August 18th at 2:00 pm by Presiding Bishop Elizabeth Eaton. Our church was asked to provide four dozen ham and turkey sandwiches for the celebration. Pastor Tom is planning on attending and Evie will be singing in the community children’s choir during the installation service. Please let him know if you are interested or have questions. This summer our outdoor worship service will be on Sunday, August 26th at Dr. Wayne and Susan Anderson’s home (7230 S&D Townline Rd. in rural Delavan). We will have a unity service on that day at 9:30 am. There will be a potluck after worship. Dr. Wayne Anderson will be grilling and all are invited to bring a salad or desert. Please also bring your own lawn chairs. Come, invite a friend, and enjoy worshiping God in the beauty of nature! There will be no 8 am worship on that Sunday. I am so excited! Why? Because this summer we are bringing back our Vacation Bible School ministry. VBS is a wonderful ministry for our Sunday school children. VBS is also a great outreach ministry for families and children in the community. In VBS we invite all children to come to our church and to hear about Jesus. For some children this may be the only opportunity that they will get during the entire year to hear about Jesus’ love for them. This year our theme for VBS is: Shipwrecked: Rescued by Jesus. The children will learn that Jesus will always be with them even through the storms of life. Would you be able to invite a child to come this year to VBS? Do you have grandchildren? Does your neighbor have children? Please help the education committee to spread the word about this very important ministry for children. All children ages 4 to 6th grade are welcome to attend. The older children are invited to be helpers and/or counselors. Please hold this ministry in prayer and pray that children might come for this week of VBS. May God bless our VBS ministry this summer and may God bless the children who will attend this week of VBS. Join us on July 16th – 19th from 9:00 – 11:30 a.m. for a fun-filled week of activities, Bible stories, songs, and games. The year’s theme is Shipwrecked: Rescued By Jesus will be sure to make a splash this summer. Ages 4 – 6th grade are invited to join us. Please let grandkids, neighbors, friends, nieces and nephews know about our fun event. Synod Assembly in the Wisconsin Dells. Pastor Tom and Mary Mock were the voting members from Williams Bay Lutheran Church. Around five hundred people from all around our synod gathered together for this year’s assembly. Almost three hundred people gathered for the National Day of Prayer breakfast at Lake. We prayed for unity and that the Holy Spirit might work among us. Kyle Marshall was confirmed on May 20th. On that day we prayed for the gifts of the Holy Spirit to be upon him and he shared his faith story in worship. Is there a special wedding anniversary coming up in the future? If so, have you and your spouse thought about a renewal of vows ceremony? It can be very meaningful for couples to renew their wedding vows and remember together the promises that they made to each other on their wedding day. Pastor Tom can offer a short, simple renewal of vows service either at church or at another setting. The service blesses and strengthens marriages. Please call Pastor Tom at the church office or reach him on his cell phone: 608.778.3319. Pastor Tom can also bring Holy Communion. PRAYER SHAWLS – SHARE ONE! If you know of someone that could use prayer support for any reason, bring him/her a prayer shawl to let them know that our prayers are with them. We have shawls in all sorts of colors to suit almost everyone. The shawls can be found in the last Sunday School room (off the Hearth Room). Just sign the sheet that you took one, attach the blue “angel tag” and share it. If you would like to be a part of making prayer shawls, join us when we meet as “Sally’s Circle Questions? Contact Sheila Lundin or Carol Choyce. This is a beautiful verse from Scripture! The verse is an important reminder for us to remember that each and every day is a gift from God. To remember this truth I started a new prayer practice. It is something that I now do each and every morning. This short but powerful prayer only takes me about seven seconds to say. Beginning my day with this prayer has inspired me to be thankful for the new day that God has given me. I encourage you to begin your day with God. It can be a simple prayer like the one that I say each morning or it can be something different. The important thing is to say something to God. Usually we begin each and every day by thinking about the tasks at hand for the new day. What if, instead, we started the day thinking about God and giving God praise for the new day? If we begin our days by giving thanks to God then each and every day would begin with us rejoicing in the Lord. You are invited to join Pastor Tom for a study on the Gospel of Mark. We meet at 11 am on Sunday mornings in the Hearth room. All are welcome! Join us for a great family event on Tuesday, August 7th. Cheer on the Milwaukee Brewers as they face the San Diego Padres. We will leave the church at 4:30 p.m. and carpool together. Game time is 7:00 p.m. Tickets will be $5.00 per person and all attempts will be made to get all the tickets together. Invite friends and neighbors as well. The deadline to sign up is Sunday, April 8th. Sign up using the sheet on Narthex table or call the Church office at 262-245-5995. ELCA Women’s Spring Gathering. Registration and Refreshments beginning at 8:30am. “Serving God and ALL Around Us” “But be doers of the Word, and not merely hearers.” James 1:22 Morning agenda: Fellowship, Synodical women’s update, Jane Harrison from “UPAVIM”, Worship and Song, Raising awareness on the problem of Human Trafficking, Election of officers For lunch, bring a salad to pass (one for every two attendees). A free will offering will be collected to be donated to “UPAVIM” and the Synodical board Please RSVP to Mary M. by April 5th. We’d like to take a group. Join us on July 16th – 19th from 9:00 – 11:30 a.m. for a fun-filled week of activities, Bible stories, songs, and games. The year’s theme is Shipwrecked: Rescued By Jesus will be sure to make a splash this summer. Ages 4 – 6th grade are invited to join us. Please let grandkids, neighbors, friends, nieces and nephews know about our fun event. Any question contact Kari P.
Pastor Tom is looking to start a new music group at Williams Bay Lutheran. If you play an instrument please let Pastor Tom or Carol Berndt know that you are interested. We are pleased to announce that the Church has a new website thanks to Pastor Tom and Secretary Rebecca Wardlow. Check it out at http://wblc.org. A huge shout-out to Alan T. and Judy N. for all the work they did our previous website. All WBLC women are welcome to join our Sally’s Circle meetings. Some of the participants knit or crochet prayer shawls or do other hand work while we talk. Our meetings are very informal and are a great way to get to know each other. We meet in the Hearth room in the lower level of the church. If you have any questions about where to get the book, please see Mary M. or Cheral S.
May 13, 2018 at 9:30 am. We invite you to join us for a special hymn service to celebrate Mother’s Day. Do you have a favorite hymn that you’d like to hear? Email the church office (secretary@wblc.org) with your request. From 2001-2004, Dave was the principal Organist here at Williams Bay Church and he was also the featured staff Organist at the Piper Music Palace in Greenfield. He enjoys concertizing frequently to many audiences including various chapters of the American Theatre Organ Society. In April of 1999, he took great pleasure being a feature artist in Melbourne, Australia for the convention of the Theatre Organ Society of Australia for which he received rave reviews. He returned “Down Under” for a six-week concert tour in Australia and New Zealand during the summer of 2003 and 2012, as well as October/November of 2015. Dave also enjoys recording and has recently “sold out” his fourth CD “Sounds of Music” recorded on the famous 5 Manual, 80 Rank Theatre Organ at the Sanfilippo Residence in Barrington, IL. There are several NEW recording projects that are soon to be completed and released. After seven years as Organist – Curator with the legendary Milhous Collection in South Florida, Dave and his family currently enjoy living in Upper Michigan in the historic town of Crystal Falls. We are seeking volunteers to provide light refreshments after the morning service for April and May. Help us fill all the empty spots. You can find the sign-up sheet on the Narthex table. Did you that you can provide flowers for our Sunday Worship? The flowers at the altar are a symbol of beauty of God’s creation and our thankfulness to God for the world God has created. The cost of the flowers is only $24.00. If you are interested in providing flowers in honor of or to celebrate a life event, please sign up on the flower sign-up sheet located by the food cart in the back of the church. Please call Pastor Tom at the church office. Pastor Tom can also bring Holy Communion. If you know of someone that could use prayer support for any reason, bring him/her a prayer shawl to let them know that our prayers are with them. We have shawls in all sorts of colors to suit almost everyone. The shawls can be found in the last Sunday School room (off the Hearth Room). Just sign the sheet that you took one, attach the blue “angel tag” and share it. If you would like to be a part of making prayer shawls, join us when we meet as “Sally’s Circle Questions? 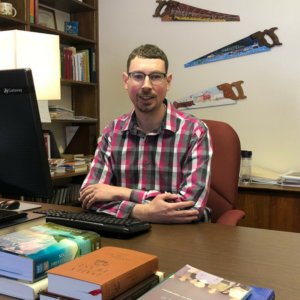 Contact Sheila L. or Carol C.
As I reflect on my first full year at Williams Bay Lutheran I am grateful for all the positive ministry that happened during the year. It was a great year! From updating our church bulletin to participating in CROP Walk for world hunger to having an outdoor worship service and picnic to commemorating the Five Hundred Year Anniversary of the Reformation, to inviting the Country Gentlemen Barbershop Chorus to our church, to participating in “God’s Work. Our Hands Sunday” at Lutherdale Bible Camp, to offering a painting party in our fellowship hall, and to worship our Lord Jesus with a full church on Christmas Eve it was a very active year for our church. Some highlights from this past year in my ministry include being asked to offer the opening prayer and invocation at the Flatiron Park for Lake Geneva’s Memorial Day Ceremony, participating in a synod-wide bike ride for world hunger, using my puppet, Marty for children’s sermons, playing guitar for worship, having my daughter, Evie assist me in a hand washing ritual for Maundy Thursday, helping Savanna Lundin in launching a church Facebook page, and in joining the Walworth County Ecumenical Pastor’s Association. One highlight from this past year that I am especially excited about is the evangelism class that I just taught during the Sunday morning class. In the class, we read the book: Unbinding the Gospel: Real Life Evangelism by Martha Grace Reese. Ten people from our congregation read the book and participated in the class. One thing that we discussed together is the need to be intentional about looking for and finding opportunities to share our faith. We also need to be intentional in actively inviting people to church. This coming year let’s all be intentional about looking for and finding opportunities to share our faith and in inviting people to church. Let’s pray that God would provide opportunities for us to share our faith. Let’s pray that God would grow our ministries. In looking ahead to the coming year I am looking forward to leading a book discussion on the topic of sharing our faith, in leading a Bible study, in giving a sermon series during the Wednesday Lent services on people from the Old Testament, in Bishop Mary Froiland’s visit in February, in teaching new songs for worship, in hosting the Ecumenical Easter Sunrise service, in having another outdoor worship service and picnic during the summer, in having a special bell-choir/choir summer concert, in partnering with Chapel on the Hill with their homeless shelter and food pantry, and in praying with you that God would richly bless our congregation in 2018. In conclusion, I would like to thank Judy Newell for her excellent work as parish secretary these past seven years. Judy was a great help for me during my first year as pastor at Williams Bay Lutheran. Thank you Judy! To take over the job we hired Rebecca Wardlow. Rebecca is quickly learning the work and is doing a great job. Come by and meet Rebecca some morning! Lent is a call for us to return to God and to renew our relationship with God and one another. Lent begins on February 14th with Ash Wednesday. On Ash Wednesday we will worship together at 7 pm. The Ash Wednesday service will include Holy Communion and the ritual of receiving the sign of the cross with ashes. For the remaining Wednesdays of Lent, we will gather for worship at 7 pm for prayer and worship around the cross. We will sing Holden Evening Prayer and Pastor Tom will give a sermon series on people from the Old Testament. You will hear sermons on Daniel, Samuel, Esther, Joshua, and Elijah. Before worship, we will gather for a simple supper at 6 pm in the fellowship hall. There will be no supper on Ash Wednesday. You are invited to use the Lenten devotional; You are the Way during the season of Lent. Please pick up a copy on the narthex table. On February 18th Bishop Mary Froiland will be visiting our congregation for the 9:30 worship service. We will be having a unity service that day with no 8:00 am worship. A special coffee fellowship will follow worship. On December 3rd we had a special guest chorus visit our congregation. The Country Gentlemen Barbershop Chorus from Lake Geneva offered beautiful Christmas music for our worship service. After worship, we were treated to some festive Christmas songs in the gathering space during coffee hour. This year we will be helping out Chapel on the Hill with their men’s homeless shelter ministry. St Benedict’s Catholic Church, who we usually work with, is not participating in the homeless shelter ministry this year. We have been invited by the Chapel on the Hill congregation to help them when they host the shelter week. The next week that they need help with runs from Sunday, February 25th to March 4th. The shifts go from 5 pm to 7 am. Only men can stay overnight but anyone can help with the evening dinner. Please contact Pastor Tom or Claus Wellhausen if you would like to help with this ministry. Looking for a way to honor someone or celebrate a milestone? Sign up to provide flowers for the Sunday worship. Sign-up sheet is located by the food pantry cart. We are reading the book: Tell it Like it Is: Reclaiming the Practice of Testimony by Lillian Daniel for the Sunday morning class. We meet at 11:00 am in the Hearth room. All are welcome. PLEASE, if you know of someone who could use prayer support for any reason, bring him/her a prayer shawl and let them know that our prayers are with them. We have shawls in all sorts of colors to suit almost everyone. The shawls are in the last Sunday School room off the Hearth Room. Just sign the sheet that you took one, attach the blue “angel tag” and share it. If you would like to be a part of making prayer shawls join us when we meet as “Sally’s Circle Questions? Contact Sheila Lundin or Carol Choyce.